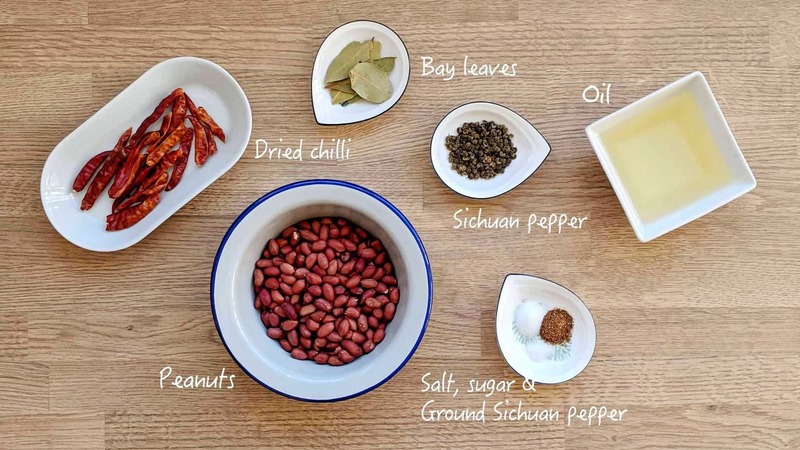 If you love simple snacks with big flavour, you must try today’s recipe: Sichuan spicy peanuts (aka Mala peanuts, 麻辣花生). The peanuts are fried to perfection, then seasoned with dried chilli and Sichuan peppercorn. It’s a perfect appetizer to cheer up your party, or an ideal homemade gift for those who are obsessed with spicy food. I discovered Sichuan spicy peanuts on my last Culinary Tour of China. On the first day I arrived home in Beijing, my mum welcomed me with a small bowl of peanuts. “Have a try! You’ll definitely love them.” She said. They were from a package branded as Huang Fei Hong Mala peanuts (黄飞红麻辣花生). I was hooked immediatley by their sensational taste: spicy, fragrant, crispy and powerfully mouth-numbing. I devoured the whole bowlful in no time. A few days later at the dumpling dinner party in Xi’an, one of the six destinations of my Culinary Tour of China, the host family offered homemade Sichuan spicy peanuts as an appetiser to my tour members. They were just as tasty as the ones I had in Beijing, if not better (especially knowing that there is no artificial flavouring or preservatives). At the end of our food adventure, both my tour members and I bought packages of spicy peanuts before leaving China. Soon after I had finished all the packages, I decided to cook them from scratch in my own kitchen. I make my Sichuan spicy peanuts without peeling off their red skin (unlike the skinless ones that I bought in China). Cooked this way, they taste as delicious and provides extra nutrition (It is believed that peanuts skin contain abundant antioxidants and a high level of dietary fibre). I suggest you choose small sized peanuts if possible as they take less time to fry and they soak in the flavour better. An important step to follow before frying the skin-on peanuts: soak them in water for 2 minutes. Moisturizing the skin will prevent it from being burnt too quickly. However, do not leave them in water for too long as over soakage will make the skin come off. To ensure the crispiness of Sichuan spicy peanuts, you need to start frying the peanuts in a cold wok with cold oil. You may adjust the volume of the oil depending on the size of your cookware. It needs to be enough to cover the peanuts half way. Keep the heat on medium-low and stir around from time to time. It took me 13 minutes from start to finish. This low temperature, slow frying allows the peanuts to “dry out” completely. The peanuts are done when the colour of their skin darkens. Taste one if you are not sure. They shouldn’t have any raw taste yet they shouldn’t have a burnt taste either. Dish them out and set aside. Please note that cooked peanuts won’t be crunchy until they cool down completely. The flavour profile of Sichuan spicy peanuts is Mala (麻辣) which literally means numbing and spicy. This classic flavour of Sichuan cuisine is created by the combination of hot chilli and Sichuan pepper. If you are interested in the unique, irreplaceable taste that Sichuan pepper offers, have a look at my post on Sichuan peppercorn. For this recipe, I choose to use green Sichuan peppercorn (麻椒), a lesser known variety, instead of the regular dark red ones. It has a stronger citrus fragrance and creates a more powerful numbing sensation in your mouth. If you don’t have access to green Sichuan pepper, please feel free to replace it with regular ones. Inspired by my dumpling party host in Xi’an, I also add a few bay leaves for extra flavour. Like cooking the peanuts, the spices are also fried the “cold start & low temperature” way. This process helps to slowly bring the full flavour out of these spices. The dried chillies and Sichuan peppercorn turn out to be very crispy so I often munch them along with the peanuts. It’s like experiencing an explosion on my tastebuds. But I’m loving it! In China, many people enjoy fried peanuts as a accompaniment to Baijiu (a type of strong Chinese liquor) and Chinese beer. Apart from as a snack or an appetizer, I also like using Sichuan spicy peanuts as topping in many dishes to give them an additional texture and an extra kick. For example, sprinkled over salad (eg. Chinese cabbage salad, Mung bean jelly salad), added in stir-fry (eg. Kung Pao shrimp, Sichuan boiled fish) or as garnish in noodle dishes (eg. Dan Dan noodles, Hot & sour glass noodle soup). Soak peanuts in water for 2 minutes. Then drain and pat dry. While waiting for the peanuts to be soaked, cut dried chilli into pieces with a pair of scissors (keep the yellow seeds). Pour peanuts into a cold wok / frying pan, then pour in oil. Turn on the heat to medium-low. Frying the peanuts for about 13 minutes (see note 3). Stir from time to time. They are done when the colour of their skin darkens . Taste one if you are not sure. They shouldn’t have any raw taste yet they shouldn’t have a burnt taste either . Transfer the peanuts to a plate lined with kitchen paper (to soak up excess oil). Leave enough oil to cover the bottom of the wok (discard the rest). When the wok cools down stir in dried chilli, green Sichuan peppercorn and bay leaves. Fry over a medium-low heat until fragrant (do not burn). Turn off the heat. Add in fried peanuts. Sprinkle with salt, sugar and ground Sichuan pepper. Shake around the wok, then dish out. Leave to cool completely. Enjoy immediately or store in an air-tight container for later consumption. The flavour will be more intense after a day or two. 1. For nutritional reasons I prefer peanuts with the skin on. You may use skinless peanuts. If so, please skip step 1(soaking the peanuts). 2. Green Sichuan peppercorn can be replace by regular Sichuan peppercorn (dark red in colour) if you don’t have the former at hand. 3. Frying time may vary depending on the size of the peanuts, as well as the power of the heat. Adjust accordingly. Hope you enjoyed reading my post and feel inspired to give it a try. Good luck in your kitchen!